Korail, with a population of 120,000, is the largest slum in Dhaka, a city of 15 million and the capital of Bangladesh. Korail is surrounded by a growing wealthy neighborhood and a lake, increasing density precludes public space. 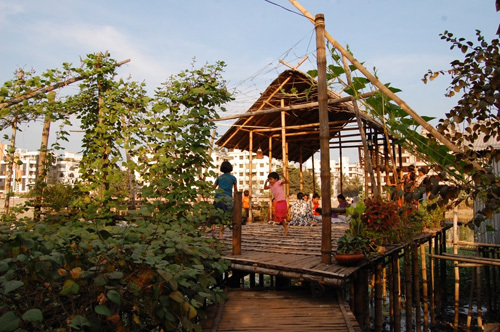 In response to these conditions the Platform of Hope (Ashar Macha) was first proposed in 2007 by landscape architect Khondaker Hasibul Kabir of BRAC University. New to the area, Kabir moved in with family of Fourkan Pervez . Together they transformed the home into a lush community garden. 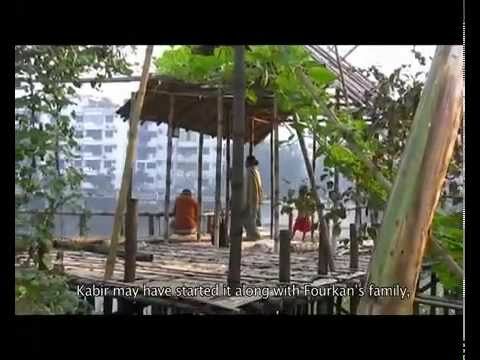 Ashar Macha (Platform of Hope) by Kabir at Korail Bosti, a Documentary by Quamr ul Hasan - A little initiative can bring about such a change to people particularly to a family and children in a so called “slum” in karail, dhaka, bangladesh. This entry was posted in Community Garden, Public Space, Slums and tagged Ashar Macha (Platform of Hope), Community Garden, Dhaka, India, Khondaker Hasibul Kabir, Korail, Public Space, Slums on January 21, 2013 by laforhumanity.